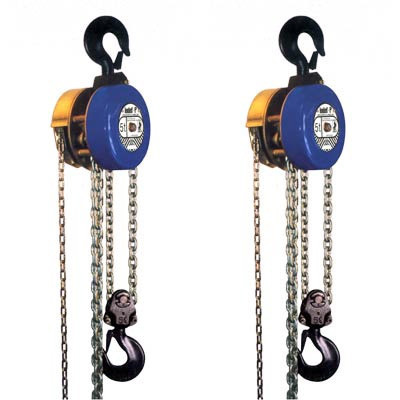 We offer our clients with quality range of Chain Pulley Block. These are fabricated using quality tested material, thus ensuring maximum efficiency, high speed, safety and smoothness in handling various loads. Further, we also conduct stringent quality checking before procuring our range of raw material from trusted and reliable vendors. Backed by experience of about a decade, we have gained an enviable position in the competitive market.Our range consists of Seeing the rising demand of industrial equipment, we also design and manufacture . These are available in various specifications and are widely demanded by various industries. The distinguished feature and high quality standards makes our range superior than the competitors. With the help of our robust infrastructure, we are capable of manufacturing various specifications of industrial products. Quality being the prime area of concern enable us to conduct stringently quality checking throughout the process. The effective packaging and transportation facility helps in timely delivery of our range at the client’s destination. Further, with our well defined business policy and transparent business dealing, we are able to develop cordial relationship with various vendor companies like Flexitech, Teeflex/unique, Coupco, Continental, MLET, and 'Renold Transtech.